First, physical fitness starts in the brain. Second, fitness is more about quality of life than looking good. Finally, time is always against us. How to hack your way to a healthier life.It’s summer time. Some kind of physical activity (even if it’s just gardening, or walking) is on the cards. And it will most probably only serve to drive home the gap between our aspirations and our current state of fitness. Use a Role-Playing-GamePhoto by: RPGYet, when it comes to fitness there are only three truths that matter. One of which no one can control. I will explain them all in a little more detail but let’s just lay them out to begin with: First, physical fitness starts in the brain. Second, fitness is more about quality of life than looking good. Finally, time is always against us. Let that sink in for a moment. The three, together, form a complex, personalized obstacle course, few manage to ever successfully solve which is why fitness which is a right and not a privilege still remains the province of a relatively few. The day truly only ever has 24 hours in it. This insurmountable obstacle frequently becomes the barrier against which the best laid plans to exercise regularly and get fit, crash and burn.Here’s how the obstacle course can be unraveled so you can benefit from physical exercise. It’s in the brain. Despite being fashioned by evolution to work, the body was also fashioned to seek rest at every opportunity and stockpile food reserves (a.k.a. fat deposits). These evolutionary adaptations enabled us to survive by making sure we could explode into action when necessary and we could survive a lean patch when it came to getting our hands on food. Fitness then starts at the mental level. We need to recognize the drives that guide us not to exercise and subvert them by making exercise fun, accessible and enjoyable. Fitness also ends in the brain not just because exercise makes us smarter but because nothing physical can ever take place without it first being modelled in the brain. Fitness is a mental game. The brain gets better at something and then the body does. This means you can use your brain to make fitness feel easier and you need to give it a little time for everything to work for you. It’s not a competition. In fitness you always compete against yourself. You already have media-created, pre-supposed visions of what you should look like (and feel you’re already short of that). You feel that before you exercise you need to get through a number of hurdles: time, timing, clothes, gear, equipment, gym membership and a personalized plan, to name but a few. Guess what, none of that really matters. Turn up, pick something, do it. Look for support if you need help. All you’re really looking for is improvements in what you can do. These will lead to improvements in how you feel and before you know it, you will also notice that you look better as well. But really, fitness is your ability to enjoy life beyond your youth. It’s that simple. There is always time. The day truly only ever has 24 hours in it. This insurmountable obstacle frequently becomes the barrier against which the best laid plans to exercise regularly and get fit, crash and burn. Don’t let it. You’re smart. Use your brain, create opportunities to train smarter not just harder. Seize small moments and add something to them. Train at work, or train when you’re travelling. The thing is that the day is never going to get any longer and the responsibilities you have are unlikely to become fewer. So you need to find smart ways to squeeze exercise into an already busy, packed day. Be smart with your time. Implement small, incremental, manageable exercises into your everyday life. 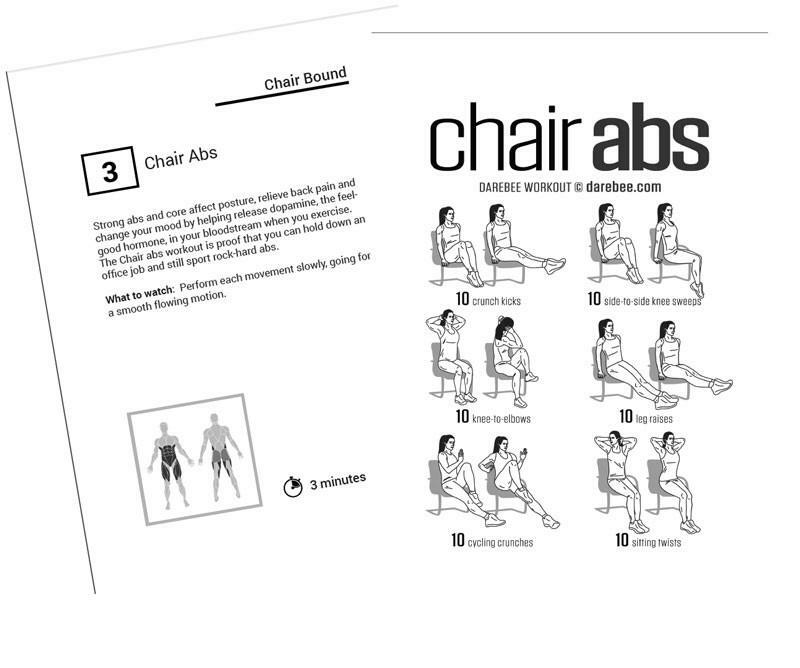 Darebee’s 100 Office Workouts gives you plenty of scope to help you get started. Finding ways to make work healthier is limited only by your imagination.The exercise you manage to do this way has a cumulative, incremental effect. You will find yourself feeling better, being stronger and capable of doing more and the smart moments you seize to maintain your fitness will get more and more challenging. In time you will find that by being clever you have hacked your way to fitness, integrating it into your lifestyle and making it part of your life. The returns of the approach are being healthier, longer. Adding not just more years to your life but more life to your years. Finding ways to make work healthier is limited only by your imagination.